Today we will cover how you can make your own, easily manageable, fully fledged portfolio site using WordPress and the Advanced Custom Fields plugin. While there are a lot of portfolio themes out there, some of them great, some of them not so much, if you find yourself wanting full control over the project, it’s always better to start from scratch. If you do want to make a portfolio site from scratch using WordPress, there’s no better tool to get you started than Advanced Custom Fields. Now before you go into ACF, you’re going to want to create a custom post type for the portfolio items. You can either do this manually, shown here in this article, or you can use a plugin like Custom Post Type UI to add a new custom post type named ‘portfolio’. When you’re creating a post type with CPT UI, you can decide what metaboxes you want to support. Do you need images? Then you can set featured image as supported, do you want excerpts? Then you can support excerpt as well. For simpler portfolios, you might not even need any custom fields, but if you need extra information like price, date published, publication, and things like that, you’re going to want to bust out the custom fields too make your portfolio easier to update and manage. What Kind Of Portfolio Do You Want To Make? Are you a photographer, designer or digital artist? Do you want to make a portfolio that mostly showcases visual content in a grid (or other) format? Are you a writer, journalist or storyteller that wants to showcase both images and excerpts along with links to your work, dates, publication, etc. We will cover how to add different functionality that fits each use case below, but first let’s get started with the basics. ACF basically lets you add extra information to posts, images or text etc, specifically to custom post types that you select. This means that we can single out many different pieces of content and work with them separately, even from within a single post. This is great for making a portfolio because it lets us write code that will automatically place things where we want them, and style things how we want them to look. For a portfolio page, this means that you don’t need to for example go into a pagebuilder and add a new thing to a column, style the different pieces of text like published date, publication, headlines, etc, every time you add a new item, you just submit a new post (in the correct custom post type) from the dashboard, and it ends up in your portfolio. For example we can add text boxes for subheadline, excerpt, date published, publication. (Or price, location, artist name, etc). What kind of custom fields you want to set up depends on what kind of content you want to show on your portfolio site. Subheading, excerpt(or enable it in CPT UI), publication date, publication, image(you can also use featured image and pull that in), link to full piece. 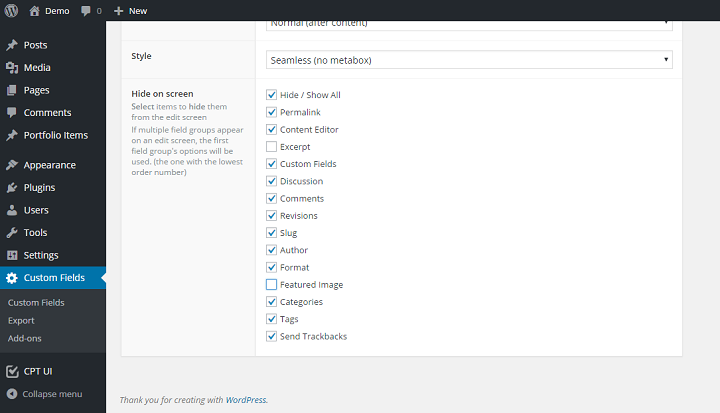 Then you can choose whether or not to hide normal WP meta boxes. Great, now we’re finished already right? Not quite. If you enter in the information and publish a complete portfolio piece, you might notice that it does not show up anywhere. This is where things start to get a little more tricky. Now we’re going to create a template for the portfolio page where we will display our portfolio content. Now just save your page.php template as page-portfolio.php into the folder of your child theme, and you’ll have an easy starting point. * The template for displaying the portfolio of our website. 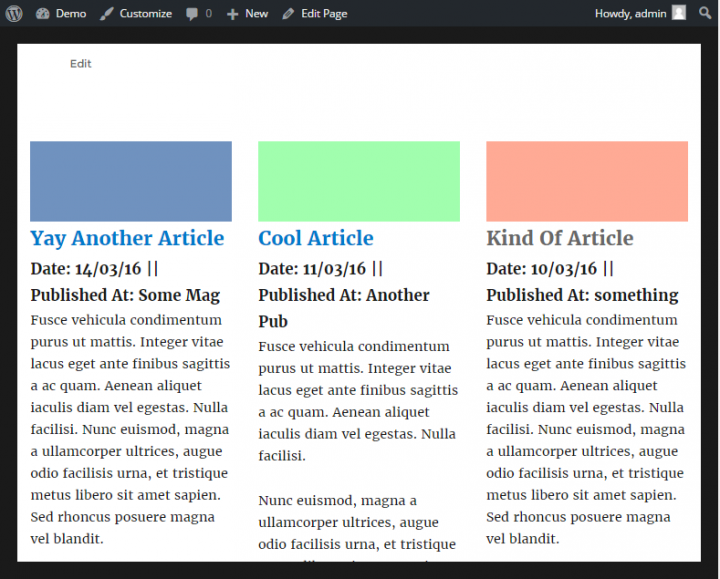 This will make WordPress recognize it as a specific page template for a page named “portfolio”, and you will also be able to choose it as a page template if your portfolio page is named something else, or you want your homepage to display your portfolio. This is what it looks like for Twenty Sixteen, but it might look different in your theme, the important part is that you will see “The Loop” there. 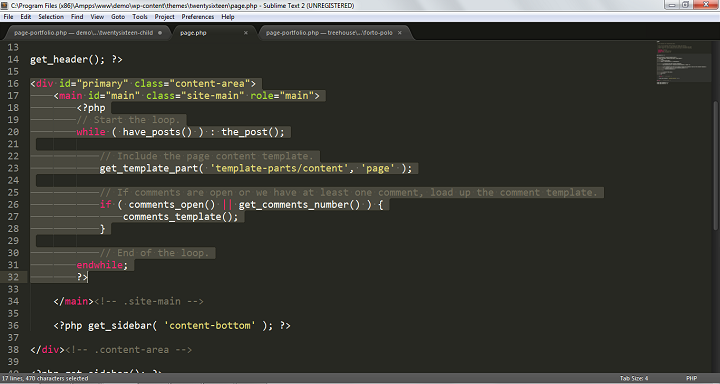 Add the plain text: ‘testing’ after the loop, outside of the PHP block and save. Create a page called portfolio (or select the template manually) and view the page. You should see testing appear on the page even though you didn’t write it when making the page. Now, after the loop, after the endwhile command, we want to start a new WP Query. This WP Query will only ask for posts that meet. This tells the query to only find posts that match the custom post type of portfolio. This means that we can finaly start coding how we want the portfolio to look. First off, we’re going to display every item that we want on our page. Now we display the featured image using the the_post_thumbnail() function. Then we close the portfolio-image div. Then we show the title in h2 tags, using the_title() function, and link to the published piece using ACF’s the_field function: targeting the ‘live_url’ field only. There’s two ways of working with ACF, you can either use their custom function the_field() to display text and get_field pull out information, or you can use WordPress’s innate function get_post_meta() to pull out the information, and then echo it out. Bill Erickson makes a good case for doing the latter in this article. Now that we show the thumbnail and title, we can show whatever we want, in this case, publication date and publication. Then finally we show the excerpt. Now you can close the div, while and if, and we’re basically done. After doing this, the portfolio items you post should start to show up. But right now they’re unstyled, coming in at 100% width so it might not look much like a portfolio, but rather a standard blog page. If you don’t want a sidebar on your portfolio page, you need to remove the get_sidebar() function from the page-portfolio.php file. Then go into the wp-admin, check the id for your portfolio page, then open your child theme’s style.css file, and add these lines of code, but replace the id number with the id for your page. From here we just need to style the individual items. Let’s say, for example, that you want to display 4 portfolio items in a row, you would need to find the relevant breakpoint in your theme’s CSS (either by inspecting the content area and looking at the different @media requests or by doing a search for your sidebar, and seeing at what screen width it’s assigned. For Twenty Sixteen, I chose the 56.875em breakpoint(920px). In the good old days, it would have been important that you used the same height and width for your images. If you didn’t, the height will become uneven. Avoiding this would mean sticking to a strict character limit (not going over or under) for any of the parts, or manually setting static heights for the divs for different screen sizes. But now, if you want a real, tangible solution to this problem without having to hardcode anything, or always follow a character limit to the T, you can install the equal height columns plugin. But even if you use this solution, try to keep the differences small, as too much difference will create a lot of whitespace. Now let’s move on to style how the portfolio items look on smaller screens(or windows), tablets and mobile. Then for smaller screens still, like a tablet that is not in landscape mode, or a phone in landscape mode, we can choose to show two items at a time with another breakpoint, and then set the width to 50%. Then finally you can set another breakpoint, or just set the standard width of the portfolio-item to 100%. When you have multiple breakpoints, it’s important that you set your breakpoint to the last one for mobiles that shows only one column, or the Equal Height Columns plugin will not work for some of your layouts. We have created a functional, responsive portfolio site that looks pretty good on any device. But there’s still a lot of styling left to be done if you want to make the perfect portfolio site for you. Have you used Advanced Custom Fields before? What kind of website did you build with it? Excellent guide – I’ve managed to create a great portfolio using this today – thank you!